The designer is a facilitator because design is an inherently collaborative activity. Collaboration is an intimate, personal activity. That makes it scary. When someone comes to you with a question, you reach into your years of experience, your education, and your own bank of knowledge. As a design expert, you answer questions from a design perspective. It's like when you visit the doctor. You tell them, "it hurts when I do this". Immediately, the doctor shifts into medical expert mode and offers a diagnosis and a treatment. To a hammer, everything looks like a nail. Edgar Schein, former MIT Sloan School of Management professor and prominent thinker in the field of organizational development has a term for when you respond to a situation as an expert. He calls this "process consulting". When you react as an expert, you work through your expert process to find the expert's answer. You revert to expert mode out of habit, before you even think to ask if expert mode is the right way to approach the problem. When you approach a project and look for ways to collaborate, you have to set aside your design expertise. Collaboration is not a design problem. Collaboration is a collaboration problem. Before you activate your design expertise to bear, you have fix the collaboration problem. Focus on outcomes to plan your workshops. What specific document do you want to walk out with? Is it a thing or list of things? Is it words or a diagram? Then, frame the question for each outcome. To facilitate a successful workshop, when it ends, you want to have accomplished something. You want to walk out with something concrete in hand you can hold up as evidence. 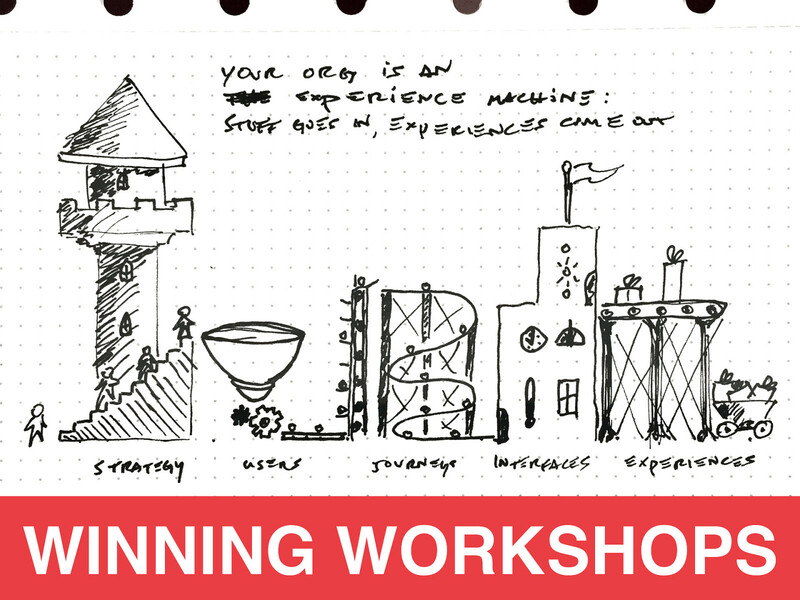 To plan that kind of successful workshop, start with the end in mind and identify what you want to walk out with. Bad workshops have hours of talk and nothing that walks, lots of discussion and no final, next step. Avoid wasting everyone’s time. Ask yourself: “What specific documents do I want to walk out with?” To start planning a workshop, I usually write down the list of outputs I would like to generate in the workshop. If you’re starting a project, maybe you know the team will produce specific outputs. Target those items for the workshop. If you’re in the middle of a project and want to hold a workshop to figure out a decision, how would you document that decision? Workshops should help you and the participants arrive at an understanding, a decision, a specific hypothesis. And wherever you arrive should be specific enough to document in a concrete output. Well-framed discussions activate the principles of collaboration. Telling your team what you're doing, why, and how creates a shared vision for the conversation. 1. Plants the seed that they will participate and shifts thinking from observer to collaborator. 2. When you tell them what they'll end up with and why it's important, they understand why they should care and encourages them to invest in the discussion and pay attention. 3. When you explain how you will do it, they know what to expect, so team knows they can trust you while you work toward the end goal. To tell everyone what you're doing might seem like a lot of build-up to just sketch a screen. It's important build up. When you let everyone know what the collaboration will look like, you set three, important expectations. First, you plant the seed that they will participate. This shifts their thinking from observer to collaborator. They imagine themselves contributing to the discussion, even taking the marker into their own hands. Second, when you tell them what they'll end up with and why it's important, they understand why they should care. This encourages them to invest in the discussion and provides incentive to pay attention. Lastly, when you explain how you will do it, they know what to expect. For example, if they expect questions before you sketch, they won't wonder why you're talking about the user and the task instead of sketching a screen. When the team knows what's going to happen, they know they can trust you while you work toward the end goal of walking out with a wireframe that everyone agrees on. Well-framed discussions activate the principles of collaboration. Telling your team what you're doing, why, and how creates a shared vision for the conversation. Specify that everyone participates when you explain how you will do it, and you include everyone. Including everyone implies everyone's input will be trusted. Most importantly, you create a psychologically safe place where everyone can collaborate. When you frame the question, it answers the questions nagging your participants’s heads. Why am I here? Why should I care? How will this work? Will I look foolish? Soothe the nagging worries in your participants mind, or they won’t the mental energy to collaborate. Make sure you explicitly frame the question. Facilitation Facilitation Glasses From “Winning Workshops” by Austin Govella, Sep 21, 2018 • Based on material from the forthcoming book, Hacking Product Design (O’Reilly) With two kids, six and eleven, Harry Potter is big at my house. When the five-year old saw the collaboration stages, she shouted, "Harry Potter glasses!” Sure enough, it does look like Harry Potter glasses. I'd like you to remember the collaboration stages as a pair of glasses. You put the glasses on to collaborate with your team. Analyze and synthesize are lenses you use to look at the problem space, ways to perceive that world. The open and close are ear pieces that attach the lenses to your head. When you start to collaborate, put on your collaboration glasses to get a good view of the problem. Facilitation Open + Generate In the open, the team generates options. Open stages start During the open stage, anything goes. You want to create with open-ended questions: lots of inputs to fuel the later stages. The more options the team generates, the better the outcomes. What different kinds of users might use this app? 2. What kinds of content can we include in this interface? During the open, you facilitate activities like brainstorming. From “Winning Workshops” by Austin Govella, Sep 21, 2018 • Based on material from the forthcoming book, Hacking Product Design (O’Reilly) In the open, the team generates a bunch of options and ideas. When you open, you "get people thinking and spark their imaginations". The Design Council calls the open "a 'phase of divergent thought', where... team members keep their perspectives wide to allow for a broad range of ideas and influences.” Open stages start with open-ended questions: 1. What different kinds of users might use this app? 2. What kinds of content can we include in this interface? During the open stage, anything goes. You want to create lots of inputs. In the following stages, the team will analyze and synthesize these inputs. Ideas generated during the open fuel the later stages. The more options the team generates, the better the outcomes. During the open, you facilitate activities like brainstorming. Facilitation Analyze + Probe Once the team generates inputs, sift through to make sense Ask questions that explore each option in more detail: of and learn more about the various options. Can you provide an example? turn, and learn more about each of them. From “Winning Workshops” by Austin Govella, Sep 21, 2018 • Based on material from the forthcoming book, Hacking Product Design (O’Reilly) Once your team has generated lots of inputs, you start to sift through and make sense of things. In the analyze stage, you want to learn more about the various options. During analyze, you ask questions that explore each option in more detail: 1. What is this made of? 2. How does this work? 3. Where does this come from? 4. Can you provide an example? Analyze is like a looking through a lens to better understand all of the inputs your team generated in the open stage. Analyze isn't the only lens. After analyze, you'll look at the options through a synthesizing lens. In analyze, take every input in turn, and learn more about each of them. Analyze to verify At first, when you ask a question to learn more about an input, you provide an opportunity for clarification. You invite people in the room to discover whether they understand something different. In a session I lead, one of a site's users was the "decision maker". I thought this meant the person who wrote the check. In reality, the decision maker was an engineer who verified a purchase met technical specifications. When we clarified the role of the decision maker, we identified a user we'd missed: the purchaser. The purchaser profile we missed during generation became one of our primary personas. Analyze to classify Understanding reveals ways each of our options are similar and different. This learning will fuel the next stage when we synthesize what we've learned. Facilitation Synthesize + Probe In the synthesize stage, you learn how various Synthesize is the second lens to understand the options relate to one another. inputs and explore how the inputs are connected to one another. During synthesize, ask comparison questions: 1. How are these options similar? During synthesize, you create affinity maps and and 2. How are they different? diagrams. Are the inputs related by time? Does one 3. How are they related? evolve to become another? From “Winning Workshops” by Austin Govella, Sep 21, 2018 • Based on material from the forthcoming book, Hacking Product Design (O’Reilly) In the analyze stage, you learn more about each generated option. In the synthesize stage, you learn how various options relate to one another. During synthesize, you ask comparison questions: 1. How are these options similar? 2. How are they different? 3. How are they related? Synthesize is the second lens you use to understand the inputs from the open stage. You use what you learned in analyze to explore how the inputs are connected to one another. During synthesize, you often create affinity maps, placing sticky notes into groups based on commonalities. You also create maps and diagrams. Are the inputs related by time? Does one evolve to become another? Are they different parts of a single process? For example, let's say you collaborate with clients to identify three types of users: 1. Prospective customer 2. New customer 3. Returning customer In analyze, you would learn how to identify each of these users. What makes a user a "prospective customer"? In synthesize, you would reveal all three are a single user, the customer, at different stages in their evolution. Facilitation Probes When you probe, you push the team to think In probe ask questions to think of new possibilities. differently. Can we apply similar things from a different context? space. From “Winning Workshops” by Austin Govella, Sep 21, 2018 • Based on material from the forthcoming book, Hacking Product Design (O’Reilly) Probe is a special stage that exists at both analyze and synthesize. When you probe, you push the team to think differently. In probe you ask questions that trigger the team to think of new possibilities. 1. What have we missed? 2. Are there different ways we could think about this? 3. Are there similar things from a different context we can apply here? In analyze, you push the team to think of additional inputs and additional ways of understanding the inputs you have. In synthesize, you push the team to think of ways to compare each input, new ways to relate them. Like the open stage, probe is a period of divergent thinking. Probe improves the team's understanding of the problem space. What ideas are more important? important, what was decided, and what to carry forward. What ideas are more feasible? 3. What ideas do we like the most? From “Winning Workshops” by Austin Govella, Sep 21, 2018 • Based on material from the forthcoming book, Hacking Product Design (O’Reilly) Close is the opposite of open. Instead of generating lots of options, you hone in and identify the final choices. The team makes decisions about the outcome. When you finish the collaboration, these decisions let you document the final outcome. You move from working with inputs to choosing the outputs. During the close, you ask deciding questions: 1. What ideas are more important? 2. What ideas are more feasible? 3. What ideas do we like the most? During close you facilitate activities like prioritization and voting. The close creates the team's shared vision about what is important, what was decided, and what to carry forward. Facilitation Example: A “Wrongs” Activity Brainstorm a list of Discuss any unclear Organize issues into Prioritize issues from issues with the current issues. groups by similarity, and most to least important. system. name each group. From “Winning Workshops” by Austin Govella, Sep 21, 2018 • Based on material from the forthcoming book, Hacking Product Design (O’Reilly) Sometimes you have distinct activities for each of the parts of the collaboration glasses. Facilitation Example: A “Goals” Activity Generate and discuss your goals for the project. Organize goals into Prioritize goals from groups by similarity, and most to least important. name each group. From “Winning Workshops” by Austin Govella, Sep 21, 2018 • Based on material from the forthcoming book, Hacking Product Design (O’Reilly) Sometimes you have distinct activities for each of the parts of the collaboration glasses. Grow Your Mind Move From “Me” To “We” Defensive learners fous on “me” Offensive learners focus on “we” Keep control Share control with the team Maximize “winning” Focus on learning Reduce negative feelings Trust your team From “Winning Workshops” by Austin Govella, Sep 21, 2018 • Based on material from the forthcoming book, Hacking Product Design (O’Reilly) Defensive reasoners ask: • How can I remain in control? • How can I maximize “winning” and minimize “losing”? • How can I reduce negative feelings? Negative feelings include embarrassment, threat, feeling vulnerable, or incompetent. Offensive reasoners ask themselves: • How can I share control? • How can I focus on learning? • How can I build trust on my team? View Winning Workshops: How to get the most from people on Notist. When I teach how to run workshops, designers worry most about facilitation. What if participants won’t join the discussions? What if attendees won’t participate? What if you can’t manage the room? But facilitation skills are rarely the problem. Regardless of the type of workshop you want to run, good workshops depend almost entirely on how you structure the activities. In this presentation, we’ll look at two strategies that maximize participation and guarantee clear outcomes and decisions. The first strategy explains how to frame and structure workshops to encourage participation and focus on outcomes. The second strategy explains how to structure activities to achieve those outcomes. Together, these two strategies help you plan and facilitate winning workshops that maximize participation and create concrete outcomes and value. This presentation will help new and mid-career designers, developers, and product managers plan and facilitate any kind of workshop. Workshops aren't the only way to conduct discovery, kickoff projects, or collaborate with stakeholders and users. I think they're the best way. These posts go into some of the rationale for when to choose workshops, as well as when not to choose workshops. Important takeaways and lessons to keep in mind when planning your own UX workshops. These seven books will help you shift your design practice to working more collaboratively with both your team and your clients. Digital walls allows you to capture virtual sticky notes, images, and sketches. You can use these to support and capture during an in-person workshop. You can also screenshare these to support remote participants or to facilitate entire remote workshops. Practical tools and activities for better product design: Product designers today can piece together several frameworks and have a new website or app up and running in a matter of days—as long as everyone on the project has the same vision. Implementation isn't the problem, but shared vision is. In this book, Austin Govella, introduces structured activities that help teams build better together. Along with soft skills, your team learns how to hack their design process to create better products and experiences.